Ok, the market appears to be in some kind of tiny wave 4 down. It's a choppy one with bounces up and down to shake out both sides, and it "may" have already bottomed? Not sure yet? It also appears to be making a bull flag as shown with the two green lines that form the flag part and a falling channel. So if the market can drop one more time to tag the low trendline of that channel I'd guess that the next move up would breakout of it and make a run for 2700+ for the tiny wave 5 up. Once done (probably next week some time during earnings) the entire rally up from the 12/26/18 low should be complete. It's some kind of B wave I believe so the move down to follow it will be the start of a C wave. But, there's also a chance that the entire move up is just a wave 4 of the big A down from the all time high last year and the next drop will only be the 5th wave of that A down... and then a B wave up into the summer will start. Since we don't know which is correct we just need to focus on catching the moves inside it the best we can. For now I think we have one more drop in this bull flag that should touch the lower part of it around 2590-2600, which might happen today or tomorrow. After this week ends though we should see that final rally up into next week for the earnings, and it should end the big move up from the 12/26 low. Now, we have a FP from earlier this month of 245.28 SPY and that will be my focus going forward into February as the most likely downside target before a turn. When it comes to FP's the short term "intraday" ones don't always market turning points but the bigger one's usually do. So when we hit that downside level I would expect it to turn back up. The hard part will be figuring out if it's just a short lived bounce or if that drop put in the bottom for many weeks to come. But that's out in the future so we'll cross that bridge when we get there. 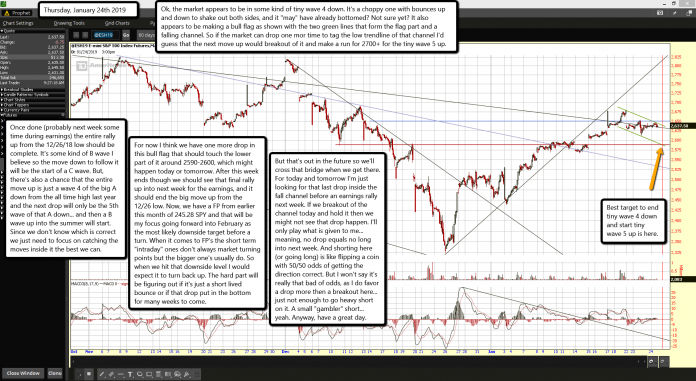 For today and tomorrow I'm just looking for that last drop inside the fall channel before an earnings rally next week. If we breakout of the channel today and hold it then we might not see that drop happen. I'll only play what is given to me... meaning, no drop equals no long into next week. And shorting here (or going long) is like flipping a coin with 50/50 odds of getting the direction correct. But I won't say it's really that bad of odds, as I do favor a drop more then a breakout here... just not enough to go heavy short on it. A small "gambler" short... yeah. Anyway, have a great day.